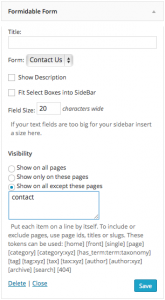 The Widgets Control plugin for WordPress is a toolbox that features visibility management for all widgets, sidebars, sections of content and content blocks. It allows to show widgets and sidebars based on conditions – you can choose to show them only on certain pages or exclude them from being displayed. Sections of content can also be restricted by using this plugin’s [widgets_control] shortcode. You can also define new WYSIWYG Content Blocks that can be used in widgets, sidebars and with shortcodes. Widgets Control features visibility management for every widget, sidebar, sections of content and content blocks. It allows to show or hide these based on conditions and you can choose to show them only on certain pages or devices or exclude them from being displayed. … you can target small, medium or large screens for mobile, tablet and desktop users. 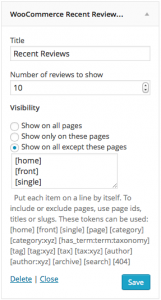 To include or exclude pages, the plugin allows you to indicate page ids, titles or slugs and tokens that identify the front page, categories, tags, etc. [home] [front] [single] [page] [category] … please refer to the Documentation for more details. On sites using WPML, widgets can be shown conditionally based on the language viewed. Widgets Control also provides flexible WYSIWYG Content Blocks and a proper widget that can be used to place them in sidebars, the [widgets_control_content] shortcode to embed freely created blocks anywhere on your pages and API functions that allow to include these blocks in PHP templates of your theme. For even more flexible control, use Widgets Control Pro which provides freely definable additional sidebars. Use display conditions to show or hide content on devices with small, medium or large displays, useful to adapt the display to mobile, tablet and desktop viewers. You can install the plugin directly from your WordPress Dashboard. Please refer to the Widgets Control documentation pages. I just installed WIdgets Control on WordPress 4.9.8 and now the Sidebar Visibility options are all I see on every single dashboard page. 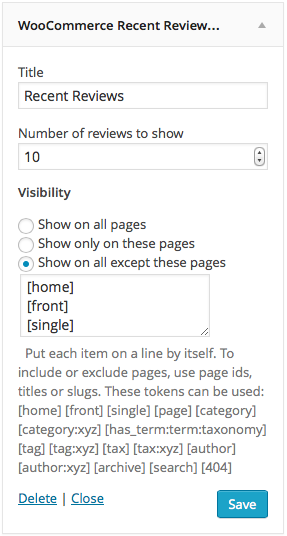 Sidebar Visibility Show on all pages Show only on these pages Show on all except these pagesConditionsPut each item on a line by itself. 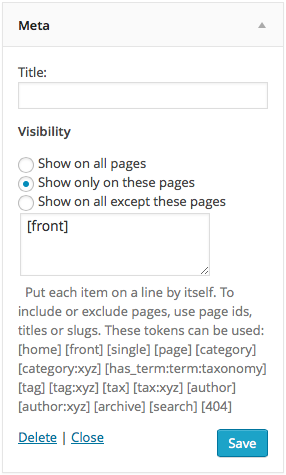 To include or exclude pages, use page ids, titles or slugs. 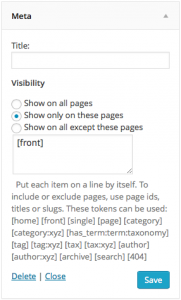 These tokens can be used: [home] [front] [single] [page] [category] [category:xyz] [has_term:term:taxonomy] [tag] [tag:xyz] [tax] [tax:taxonomy] [tax:taxonomy:term] [author] [author:xyz] [archive] [search]  [small] [medium] [large]Please refer to the Documentation for details. I am going to have to delete the plugin directory manually. This points to a conflict created by another plugin, the active theme or any customizations as this does not happen on a normal installation. On your setup, I would assume it is most likely caused by anything that also modifies aspects on the back end. Hard to say, but the usual routine to find out what’s the cause is to reduce the number of active plugins and use a standard theme. Then enable things individually until the issue comes up again. When the widget isn’t visible, their is a white gab, is there any solution to replace the text to the middel of the page and not next to the white area? Can you please provide a link to the page where this happens and point me to the specific widget you refer to?